Taking full advantage of Nikon’s long successful history in optical technology, the Monarch 5 binoculars are evidence alone of the sophistication and expertise used to create such high performing sports optics. Designed to give lovers of the outdoors the chance to observe nature in all its spectacular glory, the Monarch 5 series reveal the smallest details, even under the most challenging light conditions. Whether you are stargazing, hiking up a rain swept mountain, or taking a voyage to spot marine life, these versatile, rugged binoculars will provide a clear view and captivate the moment perfectly. Exceptional image quality is realised across the Monarch 5 range with an advanced lens and roof prism construction. The objective lens diameters of 42mm or 56mm, combined with magnifications from 8x to 20x suit an array of situations to ensure you get the best possible view. Employing Nikon’s legendary ED glass to minimise chromatic aberrations, images of superior contrast and outstanding resolution are delivered. For excellent light transmission across the visible range, dielectric high-reflective multilayer prism coatings offer bright, sharp images with natural colours even in poor light conditions. A phase-correction coating is also applied to guarantee high resolution images at any distance. Made for intense use even under formidable conditions, Monarch 5 binoculars are extremely practical with all models using waterproof and fog-free construction. With a robust housing, the binoculars are waterproof up to 1 metre for 10 minutes, and to prevent fog or mould from forming inside the optical system, Nikon have used nitrogen gas, so a sudden change in weather won’t cloud your view. Durability and waterproofing are must-haves with a wide field of view advisable. For boat use, Vibration Reduction is recommended. Large objective diameter, bright optics and distortion correction are recommended with waterproofing optional. 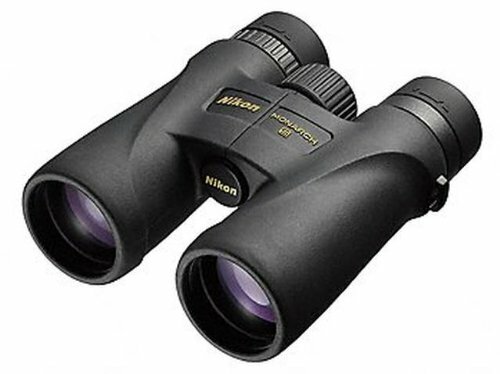 Sometimes a split second is all you have for that dream sighting of a rare bird, but with decades of design experience, Nikon know how to engineer binoculars that are easy to use and quick to adjust. With this in mind, features have been included to provide effortless operation ensuring you get the very best from these accomplished sports optics. So whether you wear glasses, contact lenses, or use your binoculars without either, you’ll have the perfect view of your chosen subject. Compensating for differences between your left and right eye, the twist-type dioptre ring helps you achieve the sharpest possible image, while the high-eyepoint design provides a clear view of the entire field even when wearing spectacles. For comfort, the multi-click turn-and-slide rubber eyecups can either be positioned outwards to provide a good eye rest or retracted when using sunglasses or other eyewear. Built to handle any environment, a fibreglass-reinforced polycarbonate body covered in rubber armouring for shock resistance means the Monarch 5 series is ready to withstand extreme use. The rubber housing also provides a firm, non-slip grip even in the wettest conditions. Flip-down objective lens caps protect the lenses from everyday knocks while allowing quick access when it’s time to jump into action. With a conveniently compact design, these lightweight binoculars are perfect for handheld outdoor use and can be worn around the neck with the wide neoprene strap provided or mounted on a tripod using the TRA-3 tripod adaptor supplied with the 16×56 and 20×56 models. For a finely tuned view, witness the magnificence of nature through the superior lenses of Nikon’s Monarch 5 binoculars. The Monarch 5 is available in two objective sizes and a range of magnifications. Take a look at the table below comparing the capabilities of each model.